It'll be the return of crewed space flight from the United States. SpaceX's priority is to get humans into space. Eventually, some of those people will end up on Mars. For now, the rocket-launching company needs to work on getting astronauts to the International Space Station (ISS). To that end, it recently showed off the hardware and astronauts that'll be part of the historical mission. The United States' last crewed space mission (it was also the final shuttle flight STS-135) launched from Kennedy Space Center in 2011. Since then, US astronauts have hitched rides on Russian rockets. Meanwhile, SpaceX, Boeing and NASA are reviving US space flight with the Commercial Crew Program. It's a boring name for something that's exciting not only for NASA but also the four gentlemen who are testing (and will eventually be aboard) the Dragon spaceship when it launches. To get to that point, SpaceX has spent years working closely with NASA and with astronauts Bob Behnken and Doug Hurley. The experienced astronauts have spent the past three years sharing their expertise with SpaceX on everything from placing buttons in the best area in the craft to building a chair that works best for reaching escape velocity (the velocity needed to escape the gravitational pull of a celestial body -- in this case, Earth) to iterating the design of the rather stylish space suit they'll be wearing. Each has two shuttle flights under his belt; Hurley was also aboard the final US space launch. Along with astronauts Victor Glover and Michael Hopkins, they are scheduled to be part of the crewed launch in April 2019 (Demo-2). SpaceX is also planning a test flight in November this year (Demo-1) with no passengers onboard. There's a lot to do before both these dates, but ahead of launch, SpaceX wanted to show off what was ready to go. 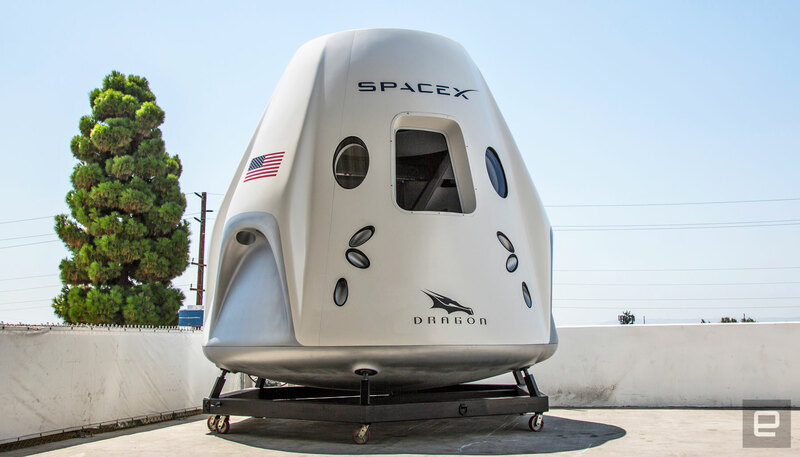 The company invited media to tour and learn about the Crew Dragon capsule and talk with astronauts and executives. The capsule itself was the biggest surprise. If you've ever seen photos of the inside of a space shuttle, chances are you remember the massive amount of gauges, knobs, levers and lights -- like the cockpit of a commercial airline but with more stuff. The Crew Dragon capsule is sparse -- Swedish design sparse. There are four chairs and a three-display control panel with a touchscreen that sits in front of the two center seats. The left screen is for situational awareness and timeline. It has the spacecraft's trajectory and when it's expected to lose communication with the ground. The center screen is for attitude (the orientation of an aircraft or spacecraft) and location of the ISS and sun. The latter is for solar charging. Underneath the screens are clusters of buttons (Commands, Pyros, Displays, Power, etc.) that for the most part are covered with plastic panels. The Crew Dragon spaceship is autonomous, and these controls are only for if that system fails. In the center of all those controls is the eject button. The capsule can be ejected from the rocket at any point during takeoff or ascent. What you won't see is a joystick. Instead, if the autonomous system fails and the pilots have to take over, they'll use the center touchscreen to control the craft. When asked about the lack of joystick during a Q&A session, Behnken said that working with SpaceX has been similar to working with aircraft manufacturers as a test pilot. Hopkins added that there are always changes and improvements to aircraft. In other words, technology marches on, and these astronauts have been part of the progression of aircraft tech for decades. The astronauts noted that they were all test pilots and that SpaceX worked closely with NASA. "We are not going to fly until we can fly safely," SpaceX President and COO Gwynne Shotwell said. That flight will put the astronauts in a capsule roughly the size of an apartment bathroom. 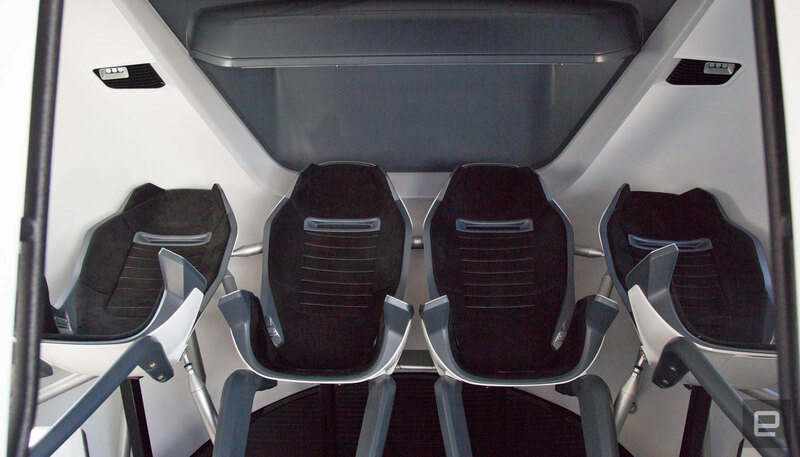 While there are four chairs, the pod will support seven passengers. The other three astronauts will actually sit below the four other humans in an area currently used as storage. Right now NASA only needs to send four people, but in the future, that crew number can expand easily, according to SpaceX. The company also showed off the simulator capsule. SpaceX feeds whatever scenario it can think of into the simulator to see how the system and astronauts react, and it will continue to use it until a few weeks ahead of the November 2019 launch. It has already adjusted the order of operation of tasks during flight and how to get in and out of the top of the hatch in various situations. When they do show up at ISS, the astronauts will probably be the best-dressed spacemen. 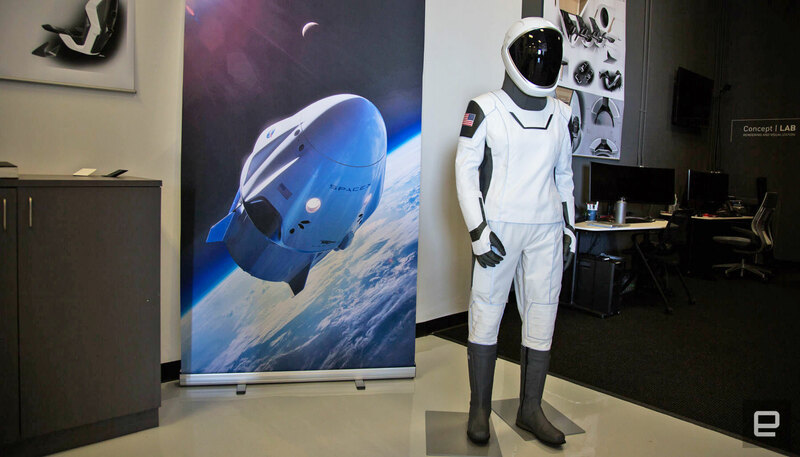 The debonair space suit they'll be wearing, like many of the other aspects of the Crew Dragon, had its design refined over time with input from NASA and the astronauts. Hurley said that older suits were huge, with lots of metal, and that the helmets weren't so great for visibility. The SpaceX suit and helmet, by contrast, are light. "Bob and I have worn the suit 20 or 30 times, and it's getting to the point where it's almost ready," Hurley said. "Almost ready" is part of the process. Each element needs to be tested again and again. The Dragon Cargo has delivered cargo to the ISS on six occasions. But this time the cargo is human, and everyone involved understands the risks. "The only thing I'm fearful of is not coming home to my family," Glover said. But he added that he thinks about that with every deployment in the military. Instead, most of his thoughts are about his first time at the ISS. "My first week in space will be my first, first week in space." Behnken is excited about space flight returning to the United States and his friends and family being able to see him take off from the Florida coast instead of watching it on TV coming out of Russia. "It's different when it's in your own backyard." Throw in that it's SpaceX's (a private company) first crewed flight, and this will be a heavily watched event. Even the unmanned Demo-1 launch in November should gather far more eyeballs than the typical Falcon launch. "We would love to say this mission is like every other mission," Shotwell said. It's not. The media Q&A was held on the SpaceX factory floor in front of the Dragon capsule clean room. At times it was difficult to hear the answers over the noise of employees building rockets for space. Glover took a moment to remind everyone that it's not just the four astronauts we gathered to interview who are making history. "All that noise in the background, that's amazing things happening." Correction: An earlier version of this article called the spaceship the Dragon Crew. It is the Crew Dragon. Also, the Dragon Cargo was misidentified as the Dragon Rocket. The actual rocket is the Falcon 9.